Loan modifications come in many different forms and at many different times as they relate to a bankruptcy filing. The most common loan modification is one that avoids bankruptcy entirely. I’m referring to a person or couple that fall behind on their mortgage, reach out to their lender for loss mitigation opportunities and are lucky enough to complete the loan modification process to a successful conclusion. This can result in an interest rate reduction, a deferment of the default to the end of the loan, a change in the length or term of the loan and in the rarest of cases, provide for a principal reduction. If this is able to be accomplished initially, then there should be no interplay between loan modification and bankruptcy. However, like most things in life, it is rarely, if ever, that simple. In my experience, listening to hundreds of clients who have either attempted loan modification or completed the loan modification process, the trials and tribulations of dealing with the lender were arduous and exhausting. People would send in documentation only to have it sit for months and months idly with the lender. When the lender finally got around to reviewing the application, the assisting documents were then stale. The borrower then had to resubmit bank statements, pay advices, award letters, family assistance statements and the like to the lender once again. While some borrowers were successful, many more were not. Many of those who were not successful turned to bankruptcy relief. When someone comes to my office with a mortgage problem, the first solution or option that comes to mind is to file a Chapter 13 bankruptcy. Chapter 13 will allow for the repayment of mortgage arrears over a maximum of 60 months while making the regular mortgage payment on time from the date of filing going forward. Thus, the homeowner actually has significant payments to make each month. There is the regular mortgage payment and the arrearage payment which is paid to a Chapter 13 trustee. The problem with this scenario should be obvious. How can the homeowner make a regular mortgage payment and an arrearage payment when there is a struggle just to make the regular mortgage payment? In these situations, the homeowner will continue to attempt to obtain a loan modification while in the Chapter 13 bankruptcy case. The loan modification process will not disrupt a Chapter 13 from moving forward. However, if the lender is willing to offer a trial modification and then a final modification, many lenders are going to want that modification approved by the judge presiding over the Chapter 13 case. This is a relatively simple motion where the homeowner’s attorney will advise in writing, that the lender and the homeowner have agreed to a modification effort and that the court’s approval is required. In my experience, the judges have not been unwilling to approve the modification agreements because they often provide a tremendous benefit to the homeowner. Many of the recent modifications that I have seen have placed the mortgage arrearage at the end of the loan and the loan has been increased to a 40 year term. 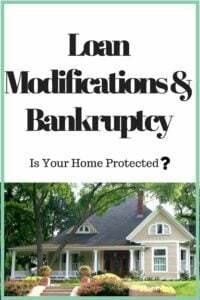 The other typical scenario is where a homeowner has already entered into a loan modification with the lender and now wants to file a Chapter 7 bankruptcy to eliminate other debt besides the mortgage debt. The issue is whether or not the loan modification will sustain itself or if it will remain intact if a homeowner files Chapter 7 bankruptcy. The answer is yes. Provided that the modification is a permanent modification and not a trial modification, then the filing of a subsequent Chapter 7 bankruptcy should not affect the loan modification. The debtor can simply continue to make regularly scheduled payments pursuant to the loan modification agreement despite having filed for Chapter 7 bankruptcy. The reality is that the debtor should have an easier time making the modified payments since other debt has been eliminated. In summary, many people are concerned that if they file for bankruptcy it will negatively affect their loan modification. Others feel that they’re already in a bankruptcy, and then they are prohibited from engaging in a loan modification. In both cases, there is understandably confusion and misinformation all over the place. In reality, loan modification and bankruptcy can and should work well together to provide relief for the homeowner. If you are in a modification and still need debt relief help or if you are in a reorganization plan and still seek a modification, you can contact my office to learn even more about your rights concerning bankruptcy and loan modification.